I don't know about you, but I love road trips. Or any trips, to be precise, I'm not that picky. Give me a chance to go somewhere, and I'll go. Even if it means flying Transasia. But if I have a choice of transport, I actually prefer traveling by car. Even if it means that I have to drive. Anyway, the reason why I like road trips is that you can stop anywhere you want (well, almost anywhere, if you can find a place to park - that can be problematic in Japan) and investigate the local area. I also absolutely love highway SAs - service areas. The bigger the better. Just had a heated discussion about the largest and the grandest service area in Kanto. Ahhh... Summer road trips in the making. And yes, it's hard to believe, but there are people in this country that will drive ridiculous distances just to visit a particular service area. On this trip, however, we skipped most of the service areas, even Yokokawa, where there's a Starbucks. We did stop at a small countryside post office in Gifu, because I suddenly remembered that it might be my chance to get some gotochi postcards. 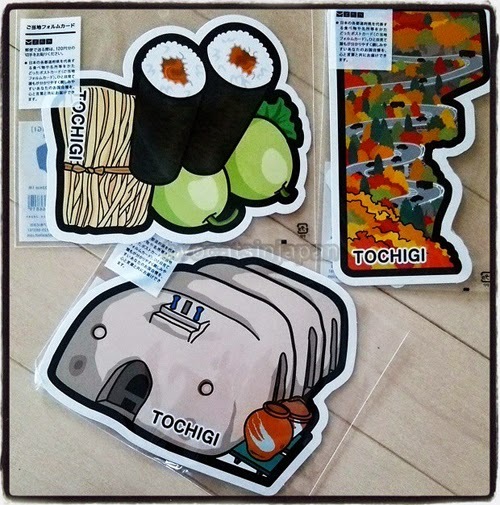 If you don't know what gotochi postcards are, visit this blog. But basically, they are prefecture specific, have odd shapes and sizes, and showcase things, places, foods and whatever else, that are characteristic for that particular region. 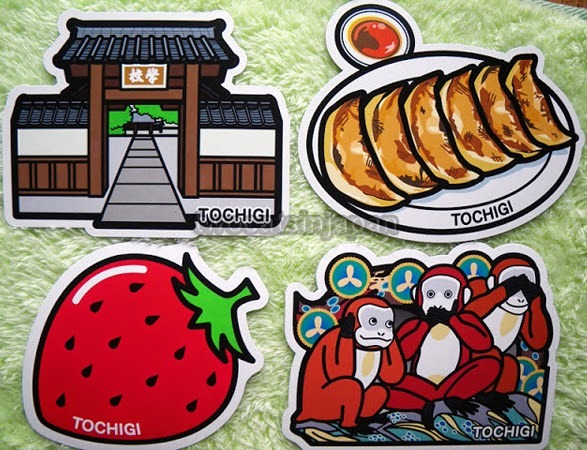 Tochigi is famous for Tochiotome strawberries. Utsunomiya is famous for gyoza. Nikko is famous for Toshogu, and Toshogu is famous for the three monkeys. Ashikaga is famous for the oldest university (technically, it's called a "school", though) in Japan. Sorry, the kampyo maki one (top left) is upside down. Kaminokawa is famous for kampyo. Nikko is famous for Irohazaka (that bendy and twisty road to Chuzenji), and Mashiko is famous for its pottery. So when I saw a post office in the middle of pretty much nowhere in Gifu (Shinhotaka area? ), I demanded we stop and hopped over to the building in the pouring rain. All six in one swoop at one post office. I'm awesome! Gotochi are released annually, and since I have 7 from Tochigi and only 6 from Gifu, that means one is missing. 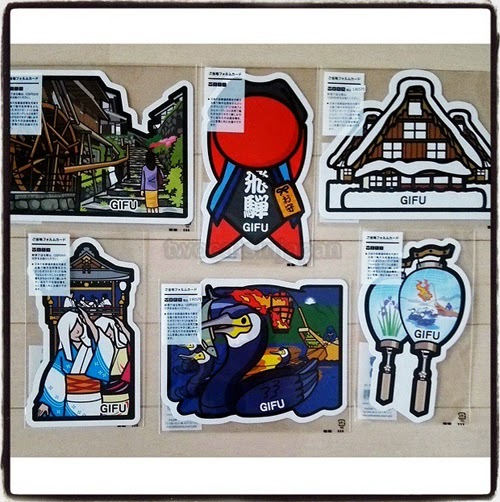 Of the Gifu ones, only the top right is familiar to me - that's Shirakawago. And now, I also learned about the top middle one. 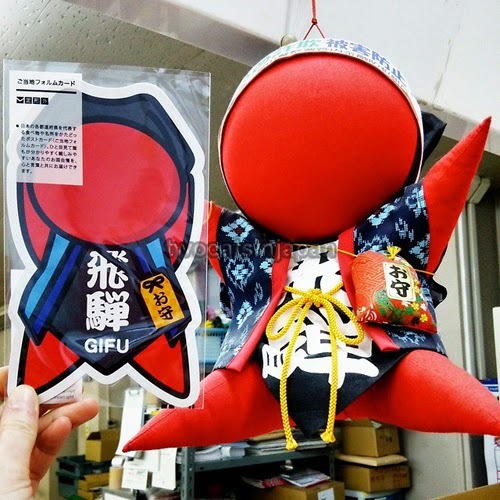 The red thing that looks like a cute mini-demon is sarubobo, a doll from the Hida region of Gifu. And apparently, there is even a Hello Kitty sarubobo doll. That alone is enough of an excuse for me to visit Takayama (the main city in the Hida region of Gifu prefecture) again. This time we just drove through on our way to Shirakawago. Next time I'll be sure to stop and explore in detail. And if you're in Takayama and have a bit of time, you can even try making your own sarubobo doll - more information here. Now, if you excuse me, I have to get ready for bed. Tomorrow is Sunday, and I have to get up at 5am and be on the train at the ungodly hour of 6 o'clock. Me and the girls are going to the chin-chin festival in Kawasaki city. Yay!